Couldn't resist! This is the most gorgeous phone I've ever held. Bar none - even some of the ‘old’ Nokia models! The look, feel, size, quality, finish and class make it worth the price alone. Pure jewellery! The edges sweep away, front and back with perfect symmetry, drawing out to thin pointed sides where they meet, and melt into, the lovely stainless steel chassis. The premium finish and look is as polished and beautiful as if it had been made by Lladró. No need to turn it on. Just look and hold! The blacker than black 5.5” Gorilla Glass 5 16:9 pOLED screen is just delightful. I've decided. We don't need tall! I’ve written elsewhere about 16:9 vs 18:9 and have concluded that they have pros and cons. I waver between them but actually, there’s a good argument for not following the trend on this. It produces 534ppi with a 1440p resolution and looks dreamy! I was surprised at how small the phone feels - but with the screen reaching out around those edges, it feels just perfect in use for my hands and for my eyes. I suppose I’d better remove my jaw from the table and get pragmatic! The panel is an LG one, so it’s said, and you can tell. There’s a kind of blue cast on it like some of the Pixel 2 XL units have. This is more pronounced as it sweeps round the curves of course. But it’s not terrible, and as many Pixel 2 XL apologists conclude, you get used to it. And you only see it on white screens. Well, for £649 upwards, I think it’s fair to expect that not to be present. But it is. So consumers have a choice. At 177g it’s a heavy phone but that adds to the class. Substantial. It’s very thin, like a wafer. Where they’ve put that 3260mAh battery I don’t know! The battery that lasts me a day. A whole day. 16/18 hours with 6 hours or so SoT and brightness set to about 35%. The brightness, for the record, is not as vibrant as, for example, my Moto Z2 Play, which I can happily use at 10% indoors. Quick Charge 4 is on offer here, which get the user up to 50% in 30 minutes, alongside (dare I cheer?) Qi Charging. The unit is protected against weather to the tune of IP67 water/dust. I’m trying hard not to compare the Sirocco with the Nokia 8 which came before it, as I think they are two very different phones. I’m really not sure why it was given a number 8 at all. It bears no resemblance to the former in size, shape or design. 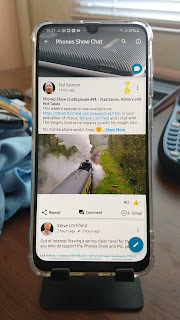 In actual fact, given that it’s software is running under the AndroidOne programme, it’s much more likely to be compared in many ways to the excellent 7 Plus, which I reviewed a few weeks ago in this very Manor. Those of you who have read my warblings before will know my attitude towards cameras. Meh. Reading around the internet about other reviewers’ findings, it seems that it’s really nothing special. In fact, some say the hardware is much like the 7 Plus’. There’s the ‘old’ Nokia Lumia Pro mode, with sweeping circles which can be employed, along with Live Bokeh mode - the usual modern things. The main camera has a 12MP sensor with f1.75 aperture, then there’s a second lens (for 2x optical zoom functions) which is a 13MP f2.6 unit. The selfie snapper is a 5MP f2 affair and all the optics are, as usual, Zeiss branded. The camera is perfectly good for social use. I’ve also had some pretty good close-up shots with the 7 Plus - so for those who want to work at it, laying aside low light photography, this, like that, is a very capable performer. If you want to take proper artistic photos and develop a hobby, buy a camera! The chipset used is kind-of last year’s really, being the SD835. However, it remains blazingly fast and those who nit-pick at this can only do so really on the grounds of potential future-proofing, not the here and now. With the 6GB RAM employed switching tasks and general functionality, speed around the UI is faultless. There’s 128GB of storage inside for one’s media but no MicroSD Card expansion on that. That’s it. But actually, I think that very few people really need 256GB or huge expansion for more media. We have this cyclical argument at PSC Towers about the benefits of having a card and conclude not very much. It’s going away - and actually the number of people like us wanting to hot-swap files around, is dwindling. In all honesty, 128GB is just fine for now. I love the Glance Screen, which does, at last, have a real feel of ‘old Nokia’ about it. There are several set-ups which can be employed, much like best-in-class LG V30, and it can also be told to stay on at all times. I’ll have to see, over more time, what that does to that battery, but the clock faces, notifications, layout and styles are all very classy and well thought out. All the usual other specs. are present, as you’d expect in 2018, including BT5, NFC and USB-C for data/charging, but it’s the employment of AndroidOne which is currently impressing me and drawing me to Nokia - and this is no exception. As did the 7 Plus before it, it has arrived with 8.0.0. and February 2018 security, but the 8.1.0. and May (or maybe even June now) is rolling and (even) users in the UK report it coming along nicely. I have no doubt it will be here in the coming days. AndroidOne makes it so clean. Uncluttered. Vanilla, almost. There’s only two additions here - the Nokia Support App and the Camera. I think it’s a breath of fresh air and we can see, after a decade of manufacturers going their own way with skins and identities of their own, at last realising the benefits of uniformity, not fragmentation. One by one many of them are at least introducing models in their range with AndroidOne. And with regular updates, I approve of course! The fingerprint scanner, like the 7 Plus, is on the back under the camera cluster and although may be (stylishly) a little small, it works faultlessly, first time, every time. The registration process is simple and quick (though not quite Pixel-quick). If you’re going to have a scanner on the back of a phone, then it’s in the right place. My usual favourite department is sound! The speaker. Singular. Yes, there’s no deep and rich stereo here, but a mono bottom-firing single speaker. I wouldn’t be surprised if it’s the same one as used in the 7 Plus as it sounds spookily similar - and to remind you of what I said about that, it’s perfectly loud, louder than the original Nokia 8 but you need to sacrifice some of that volume in equalising out some of the top-end and introducing some bottom. It’s perfectly good, but a long way from the usually-quoted best-in-class, which I’ll spare you from mentioning again! The recording setup is the same as the Nokia 8, in that it employs OZO in 4K Video recording mode only, but when it does, and you hear it through headphones, it really is stunning. Nobody seems to have still got their finger out and developed an audio-only option, so users are stuck with workarounds. Don’t weep now - you should be used to it by now - but there’s no 3.5mm audio-out! (We’ll soon stop even mentioning that in reviews, like we did NFC or BT!) You do get a 3.5mm to USB-C audio adapter, however, so keep it in your wallet! In the box, you get the audio adaptor, the fast charger, A to C cable, usual pokey-tool, a revolting pair of claustrophobic ear-buds and a semi-rigid plastic case. The case fits like a glove and actually isn’t all bad. It doesn’t protect the phone very well, except for the edges and corners, but it does a good job of not hiding the lovely design too much so that it can still be mvch admir’d! But all this review clap-trap is not what this device is about. It’s unashamedly a piece of style, class and jewellery reflected in the price. 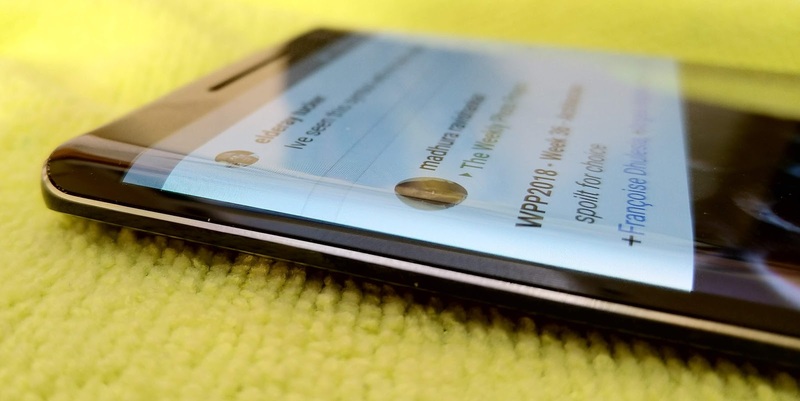 As a phone, it’s far from perfect, but that’s not the point. Yes, I’d rather have better speakers, a Samsung screen and bigger battery, but in the same way that a Planet Computers Gemini or BlackBerry KEYone owner reflects, the focus here is different. You own it because you want it and love how it is. You accept the shortcomings as a phone for the enjoyment you get from it in other ways. I’m sure that many will think I’m nuts, but I think it’s the best £649 that I’ve spent in a very long time and if my rotating phone-pot-fund is depleted accordingly for some time to come, so be it! I love it! By the way, the more patient folk out there who really want one of these, I’m sure it’ll be down to £499/£449 fairly soon’ish.